Just four days before the International Conference on the Great Lakes Region was held in Kampala, President Museveni rushed to Angola on a two-day “official visit”. We have been told that the real reason behind the impromptu visit was to dissuade his counterpart, Jose Eduardo Dos Santos, from sending soldiers to the eastern part of the Democratic Republic of Congo, where war is raging. 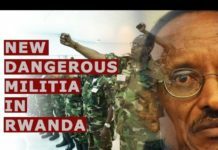 Highly placed sources have told The Observer that Dos Santos, who was a staunch ally of the assassinated Congolese leader, Laurent Desire Kabila, had prepared an elite force to route out Bosco Ntaganda’s M23 rebels from the war-torn North Kivu province. Kabila was succeeded by his son, Joseph Kabila, who has been president since 2001. According to our sources, Museveni reportedly convinced Dos Santos that the Great Lakes region meeting in Kampala would find an amicable solution to the North Kivu conflict, which would be acceptable to his ally Joseph Kabila. Dos Santos agreed and sent his minister to represent him at the Kampala summit. With Dos Santos on board, Museveni not only used the Kampala summit to rally the region for a peaceful settlement of the conflict in the DRC, the meeting of heads of state also gave him an opportunity to underline his credentials as the regional leader of choice on matters of conflict and peace. The Kampala summit, which ended on Wednesday, also succeeded in bringing Kabila and Rwandan president Paul Kagame face-to-face. They had last met in Addis Ababa, Ethiopia, in July. On Tuesday, the day the summit began, Kagame, who has been at the receiving end of a Western onslaught that included cutting aid to his country on grounds that Kigali supports the rebels, arrived at the Commonwealth Resort in Munyonyo, a pensive man. The allegations, which Rwanda vehemently denies, are based on a UN report. Alongside Kagame were two of his trusted lieutenants, Defence minister, Gen James Kabarebe, and Foreign Affairs minister/government spokesperson, Louise Mushikiwabo. Kabarebe, a battle-hardened soldier, served as Chief of Staff in the DRC before Laurent Kabila dismissed him in July 1998. He was replaced by a Congolese, Celestin Kifwa. In a closed meeting between Kabila and Kagame, sources told us that the two leaders accused each other of backing rebels in their countries. Kabila said the Kigali regime is backing the M23 rebels but Kagame rejected the accusations. In turn, Kagame accused the DRC of harbouring Hutu extremists who masterminded the Rwanda genocide in 1994. Both leaders walked out of the meeting stone-faced. However, by the closure of the summit, the despondency depicted on day one had dissipated, replaced by smiles on the faces of both leaders as they appended signatures to a position the summit had adopted. The heads of state agreed on one important point: the Great Lakes region countries would send a neutral force to the war-torn DRC region. Uganda’s acting Foreign Affairs minister, Henry Okello Oryem, said a sub-committee of Defence ministers of Angola, Burundi, Congo Brazaville, DRC, Rwanda, Uganda and Tanzania, would formulate a position on the planned deployment by August 15. The ministers would then hand a report to the heads of state who will meet in Kampala in four weeks’ time to rubberstamp the decisions of their ministers and craft some details. “The ministers will agree on the modalities, like the size of the neutral force, what logistics are required and when to deploy,” said Oryem. However, as the leaders mulled over this position, the major question was who would constitute the neutral force. There are fears that the deployment of a force involving Rwanda and Uganda, who have a negative history in the DRC, would evoke bitter memories. It is also unlikely that the DRC would accept such a force. The armies of Uganda and Rwanda were involved in the DRC in the late 1990s and early 2000s, with disastrous consequences. Their involvement on the rebels’ side had precipitated the entry of Angolan and Zimbabwean forces on the government side. In the end, not only did Uganda and Rwanda disagree and fight amongst themselves, the two countries’ armies were accused of looting Congolese resources. Kenya’s vice president, Kalonzo Musyoka, was sceptical when asked about the neutral force. “It might not be a solution but a definitive step,” he said. Uganda’s Permanent Secretary in the Foreign Affairs ministry, Ambassador James Mugume, said great lessons had been learnt. “We have established joint intelligence fusion centres where every country [in the Great Lakes] can share intelligence and analyse it. That way you build confidence,” he said. Okello Oryem was more optimistic. “We should look at the spirit at this summit,” said the minister, who read out the heads of state’s declaration at the end of the summit. “The fact that these presidents signed this declaration means they are serious. Let us be positive despite the UN report. President Kagame and Kabila are on talking terms and we shall put some people to shame,” he said. The leaders also agreed to impose sanctions on any country that supports the M23 rebel movement and other rebel groups operating in the vast mineral-rich country. As the leaders departed, an unidentified man rushed to the foyer of the hotel and issued a dossier to the journalists. The summit might have made headway in seeking a consensus, but a lasting solution to the DRC conflict remains elusive.